We're finally getting the Miles Morales version of Spider-Man in Sony's animated Spider-Man: Into the Spider-Verse, but he's only one of many different versions we'll get to see. Many of them came swinging into Sony's Comic-Con panel at Hall H, which included producers Phil Lord & Chris Miller, Shameik Moore as the voice of Miles, Jake Johnson as Peter Parker, and Hailee Steinfeld as Spider-Gwen. Yeeesssss! 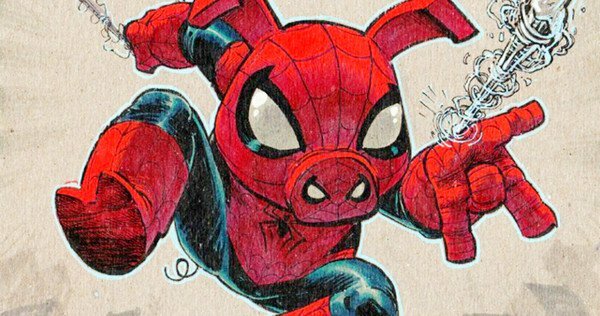 Spider-Ham was shown at the end of some brand new footage from the film, with confirmation that John Mulaney will be voicing Peter Porker. Yes, he is a real character with a real comic book series back in the day, a comic that I love. Obviously, The Spectacular Spider-Ham was a satirical riff on Spider-Man, but it was great stuff. The reason he exists again now is that Into the Spider-Verse connects all sorts of Spider-Men from different dimensions. Also included in that will be Nicolas Cage as the voice of Spider-Man Noir, news that was confirmed just weeks ago. The last Spider-Man to be introduced was the anime-style Peni Parker aka Sp//dr, voiced by Komiko Glenn. Peni is accompanied by her super robot which, at least in the comics, is partially controlled by a radioactive spider. This movie should be awesome. Spider-Man: Into the Spider-Verse opens December 14th.